The City of Lebanon, local businesses, and charities have planned several events in April that are worth marking on your calendars. Here are 5 that will appeal to most residents. If you know of others, leave a note in comments to share with the community. 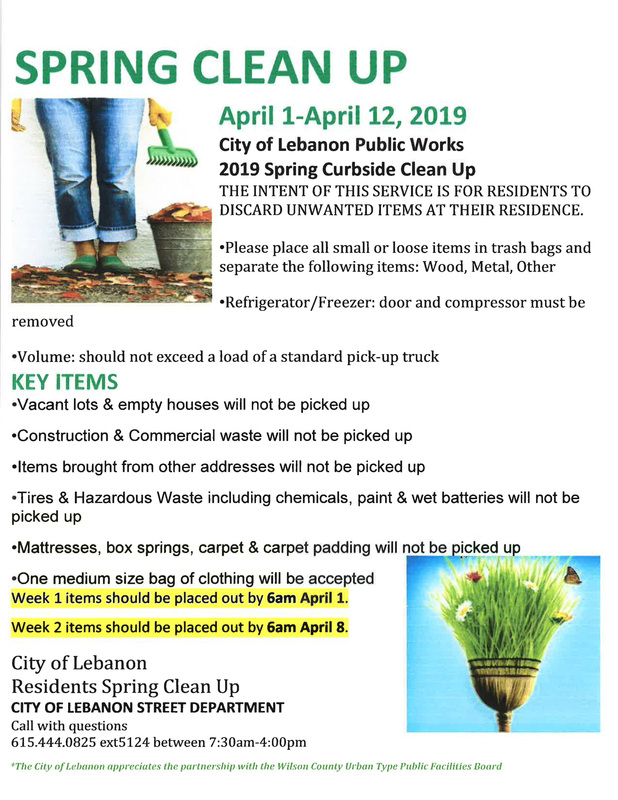 The first two weeks of April are the time for Lebanon Public Works Annual Spring Clean Up. This generally takes the entire workforce. Hundreds of tons of debris are collected each year. Unacceptable Items: any hazardous waste including Antifreeze, Batteries, Compressors, Florescent lights in a volume of more than fifteen, Paints, Used motor oil, and Used Tires. Volume Limit – approximately that which would fit in an average size pickup truck. We do not accept any contractor or commercial waste and we do not accept waste from vacant properties or outside the city limits of Lebanon. Click flyer on right for more details. The Lebanon Senior Center Indoor Yard Sale will have lots of great treasures for sale and they are accepting donations now. Do some spring cleaning and bring in your goodies! Come shopping for more goodies! All proceeds will go directly to The Lebanon Senior Citizens Center. Tell your friends and neighbors! 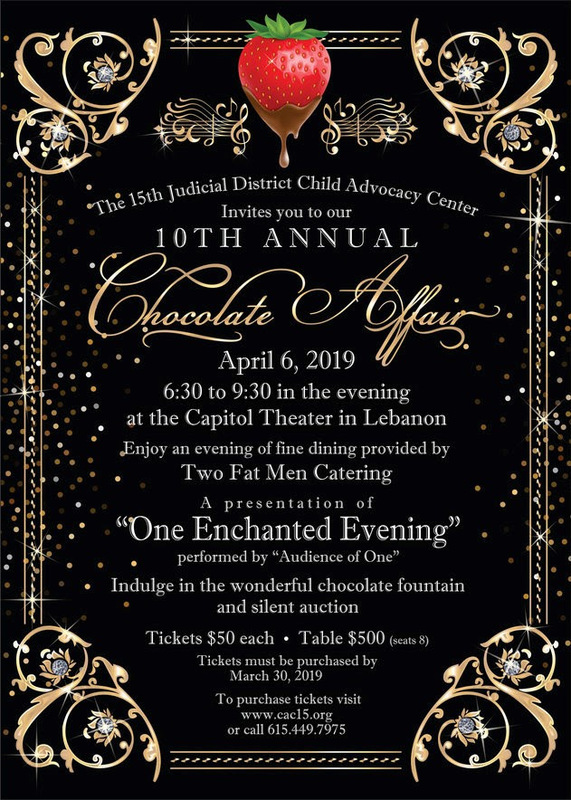 The 10th Annual Chocolate Affair fundraiser for the 15th Judicial District Child Advocacy Center will be held April 6th in conjunction with “Child Abuse Prevention Month”. Guest will enjoy an evening of fine dining, a performance of “One Enchanted Evening” by Audience of One, and indulge in the wonderful chocolate fountain and silent auction. Purchase tickets on https://www.cac15.org/ or call (615) 449-7975 Click Flyer to right for larger image. In August of 2013, Jere McCulloch passed away while riding, something he dearly loved. Jere, a local father, attorney and business leader was an avid cyclist and sports enthusiast. We honor Jere with a 15-mile ride, 30-mile ride, and 50-mile ride. Jere’s Ride benefits Empower Me Day Camp, a nonprofit organization established in 1999 for special needs individuals. Jere was an avid supporter of Empower Me Day Camp in many ways. Proceeds will help build a Miracle League Baseball Field which has a specialized turf that allows children in walkers or wheelchairs to move smoothly over the surface. Pick up your course information, t-shirt, etc. the day prior to the event from 9am-5pm at Pinnacle Financial Partners-1412 W Baddour Pkwy, Lebanon, TN 37087. Questions? Contact Britney Wilkerson at 615-598-0733 or BritneyWilkerson@EmpowerMeCenter.Com Free meal at Blue Moon Barbecue after the ride. Is your roof standing up to the harsh weather in Lebanon? Unfortunately, it’s not always easy for a homeowner to see a problem until the damage has progressed to ceiling damage. 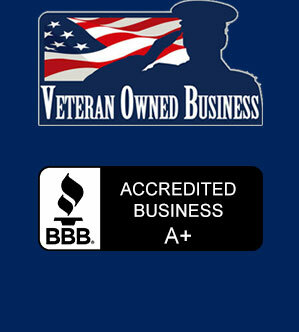 Give us a call and ask about a free Spring Roof Inspection. Limited Time Offer. Call Jason at 615-784-4628 for details.